We're always looking for new and exciting ways to leverage our existing equipment and capabilities, as well as to venture into new areas for the benefit of our clients. Please let us know what unique event experience you need and we'll come back to you with a concept or two that matches your vision and budget. We have been selected as a Matterport Service Partner to bring this amazing technology to our clients. Check it out at www.FromAnyAngle.com and let's talk about building a 3D Model and Showcase of your Venue or Event Space. This allows prospective clients across town or anywhere in the world to take a virtual tour from the comfort of their home or office. Capture your venue and event from a brand new perspective... up in the air! We experimented with drones but after our due diligence (and a few mishaps that would have caused serious injury or worse if they took place over an event) we decided that's not for us. Our insurance company and attorney agrees. So... we have the next best thing and that's pole photography. We can shoot from as high as 18' which gives you an amazing birds-eye view without the liability of flying a drone over your event. Your event is at the center of everything we do. We are a multifaceted event entertainment company utilizing cutting edge photo and video technologies, along with good old-fashioned fun, to help you create a memorable event for your clients and guests. We're focused on the guest experience! We are active supporters of several professional trade organizations, associations and CVBs. We have built our business by developing close working relationships with professional meeting and event planners, as well as with other industry suppliers. We are very proud to have been chosen as Outstanding Supplier once and Supplier of the Year twice by the Orange County Chapter of Meeting Professionals International (MPI). 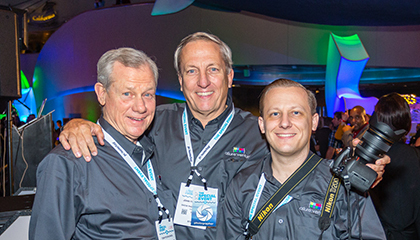 The photo below of three happy Irishmen (all Fitz's) is from The Special Event Show held in Long Beach where we were honored to serve as the Official Show Photographers.